Grant was born in Inverness-shire. His childhood was spent in India. He returned to Britain in 1893. Encouraged by the French painter Simon Bussy, he began painting, entering the Westminster School of Art, London, in 1902. He spent 1902-3 in Italy and attended Jacques-Emile Blanche’s school, La Palette, in Paris in 1906-7, returning to London to spend one term at the Slade School of Art. Through Bussy he met Matisse in 1909. He subsequently set up his own studio in Fitzroy Square, London. He visited Greece in 1910, and frequently visited Paris before the war, making several visits to Picasso’s studio. Grant was a central figure in the circle of artist and writers known as the Bloomsbury Group,which included Grant’s cousin Lytton Strachey, Maynard Keynes, Roger Fry, Virginia and Leonard Woolf, Virginia’s sister the painter Vanessa Bell and Vanessa’s husband the critic Clive Bell. Grant and Vanessa Bell were closely associated in their professional and personal lives for more than fifty years. In 1913 Roger Fry founded the Omega Workshops, of which Grant and Vanessa Bell were directors. The workshops produced furniture, pottery and textiles designed by various young artists including Grant and Bell themselves. The Omega Workshops closed in 1919. In 1916 Grant and Bell moved to Charleston near Firle, Sussex. They had a daughter Angelica in 1918. Together they decorated several houses, including Charleston, and carried out other commissions, including decorations for the church at Berwick, near Firle (1943). Grant exhibited at the New English Arts Club from 1909 and the Friday Club (founded by Vanessa Bell) from 1910. He became a member of the Camden Town Group in 1911. In 1913 he exhibited with the Grafton Group, whose members included Fry, Bell and Wyndham Lewis. 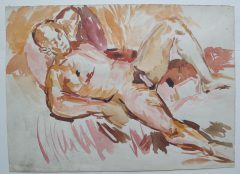 Influenced by the works of the Fauves and Cézanne in the first Post Impression Exhibition of 1910-11, Grant contributed to its successor in 1912. He participated in the Twentieth-Century Art show at the Whitechapel Gallery, London, in 1914. He became a member of the London Group in 1919. His first solo show was held at the Carfax Gallery in 1920. He was a member of the London Artists’ Association from 1929 to 1931. He was represented at the Venice Biennale in 1926 and 1932, and his work was included in the Coronation Exhibition of Contemporary British Artists at Agnew and Sons, London, in 1937. He designed sets and costumes for various theatrical productions. A retrospective of Grant’s work was held in 1959 at the Tate Gallery, with subsequent Arts Council tour. He was given a retrospective at Wildenstein & Co., Ltd., London in 1964, a two-person show with Bell at the Royal West of England Academy, Bristol, in 1966, an Arts Council tour in 1969, and solo shows at the Anthony d’Offay Gallery, London, in 1972 and 1975. In 1975, in honour of his ninetieth birthday, exhibitions were held at the Tate Gallery and the Scottish National Gallery of Modern Art.